To this point, the field of lubrication has been conceptualized using several noncontiguous modes of operation — boundary, fluid-film, and dry and solid lubrication. Engineers and analysts have long had to deal with old evidence that many tribological devices, such as flat surface and centrally pivoted sliders, can act as viable bearings — contradicting basic hydrodynamic theory. 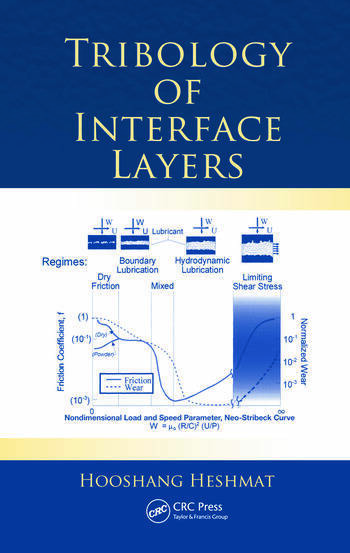 Tribology of Interface Layers introduces a new concept wherein disparate modes are shown to actually be particular phases of a tribological continuum spanning a wide array of material lubricants. The author details these phenomena and presents a novel definition of lubricants as intermediate layers. The book illustrates that contrary to previous understanding, the various lubrication modes — from dry to hydrodynamic to powder lubrication — all overlap each other within a tribological spectral continuum. It also elucidates the fact that bearings, seals, dampers, and similar devices using submicron powder lubricants possess quasi-hydrodynamic characteristics akin to conventional fluid films. Similarly, powder films possess quasi-hydrodynamic features that enable them to act as conventional fluid film bearings. The field of tribology has traditionally been presented in terms of disparate regimes, but this method of classification lacked sufficient rigor. This volume explains that characterization and treatment of any one regime may require the simultaneous accounting of several different modalities that are present in a particular mode of operation. Based on experimental and theoretical work, this text shows how the interdependence of powder and hydrodynamic lubrication exemplifies that perpetuity in tribological processes. Author Hooshang Heshmat was on hand for a book signing at the 2010 STLE Meeting. Dr. Heshmat was the 2007 recipient of the Mayo D. Hersey Award, bestowed on an individual in recognition of distinguished and continuous contributions over a substantial period of time to the advancement of the science and engineering of tribology. President & CEO/Technical Director, Mohawk Innovative Technology, Inc.
Dr. Hooshang Heshmat is Lead-Founder and President/CEO & Technical Director of Mohawk Innovative Technology, Inc. (MiTi), an internationally renowned applied research and product development company dedicated to green technology. His company specializes in the design, integration and development of mechanical components such as advanced oil-free foil bearings, seals, and dampers, including powder, solid film coatings and dry and fluid film bearings into high-speed oil-free rotating machinery systems. Developed rotating machines employing his novel tribological devices include oil-free compressors, high-speed motors and generators, and gas turbine engines down to Mesoscopic sizes. He has developed special tribological testing methods and measurement techniques and has designed and fabricated the corresponding component test equipment. Dr. Heshmat has established MiTiHeart® one of the premier biotechnology companies in the Albany area based on their unique heart pump system, which uses magnetic levitation. An STLE and ASME Fellow since 1998, he is listed in Who’s Who in the World, Who’s Who in America and has received numerous STLE and ASME awards: STLE 1983 Wilbur Deutsch Memorial Award, ASME 1985 Burt L. Newkirk Award, STLE 1993 Captain Alfred E. Hunt Award, ASME/RCT 1995 Creative Research Award, STLE 1996 Al Sonntag Award, ASME/IGTI 1999 Best Paper Award, ASME 2002 Thomas A. Edison Patent Award, STLE 2003 Frank P. Bussick Award, ASME IGTI 2005 Microturbine and Small Turbomachinery Committee Best Paper Award, the ASME 2007 Mayo D. Hersey Award, the STLE 2008 International Award, the Pennsylvania State University 2009 Alumni Achievement Award and the ASME 2009 Propulsion Best Paper Award. Dr. Heshmat received his BSME from Pennsylvania State University and his MSME and Ph.D. in Mechanical Engineering from RPI. He is the leading authority in foil bearings and powder lubrication technologies. He has played a primary role in the development of compliant foil bearings & seals and has been responsible for major advances in this field, including analytical and experimental research for bearing & seal design and application. Dr. Heshmat holds 28 patents, has authored/co-authored more than 175 papers, and has co-authored 2 chapters (Principles of Bearing Design for the Compressor Handbook and Principles of Gas Turbine Bearing Lubrication and Design for the Theory of Hydrodynamic Lubrication). For more details and a listing of his publications visit http://www.miti.cc .